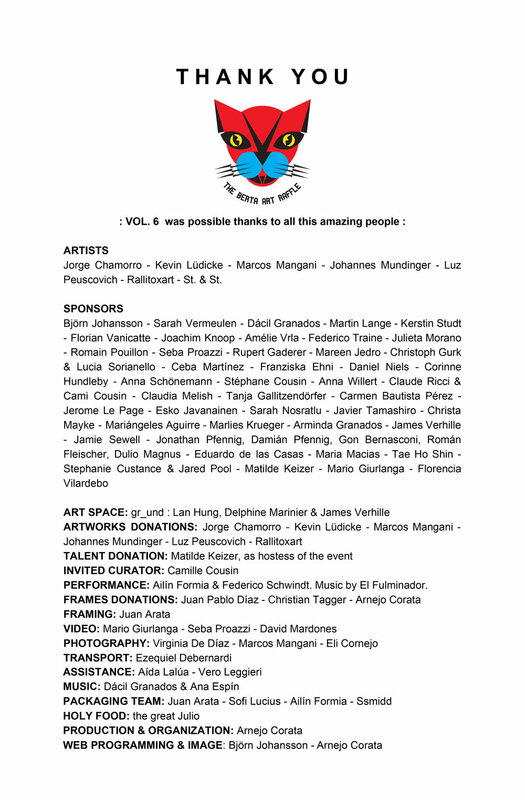 Thanks to everyone that made VOL. 6 possible! Yes! a win win situation. Everyone gets to take home an original work of art at the end of the group exhibition, making YOU a sponsor of the artists and this project. At the same time, a platform is provided to the artists, not only to display and promote their work, but also to further their careers. It consists of 50 original art works and 50 lottery numbers . Art lovers ACQUIRE a number on a donation basis, but they don’t know which artwork they will take home until the raffle takes place at the end of the exhibition. like previous editions, vol. 6 was sold out before the evening’s event. Meaning that The gallery was empty by the end of the project. Organized by Arnejo Corata, Juan Arata & Eli Cornejo. Curated by Camille Cousin and ELi Cornejo. The Berta returned to Wedding, to Gr_und, an active art space for the materialisation of curated concepts. Thanks to it's team for the trust and support! Special guests shared the night with us: the talented and versatile Matilde Keizer hosted the event and Dácil Granados, a.k.a Playa Chica Dj, and Ana Espín were in charge of the music, playing sparkling sets through the night. There was also a bar with snacks and drinks, an art lottery. We had such a lovely Sunday afternoon! Where: Gr_und, Seestr. 49, Wedding - 13347 Berlin - Germany / U6 Seestr. Art Raffle-Finissage: 3rd december, 17Hs- 22hs. This is a NON PROFIT PROJECT. The team of organizers, curators and volunteers of this project donated their time and skills to make it possible. The organization of The Berta Art Raffle and the art space gr_und did not receive any monetary compensation. STAY in touch if you would like to participate in the berta art raffle as sponsor of this project. Contact us if you would like to stay informed about future calls. Video invitation VOL. 6 by Sebastián Proazzi. Video created by Greg Latham - Thanks a lot Greg for your amazing work! Video credits - Camera & edition: Gonzalo Bernasconi - gonbernasconi@gmail.com. Thanks Gonza!